The giant panda is an international conservation darling and a leading domestic tourist attraction. But the country is home to many other intriguing species that travelers can encounter if they know where to go, Erik Nilsson writes. Three millennia ago, an ox, a donkey, a horse and a deer retreated to a woodland cavern to meditate. They snapped out of their contemplative state when a tyrannical king executed a just official. So, the animals decided to combine into a single beast to fuse their respective powers－the might of an ox, the spatial reasoning of a donkey, the swiftness of a horse and the nimbleness of a deer. The Lord of Heaven gave the creature the go-ahead to join the war against the cruel king, and sage Jiang Ziya rode it to defeat the despot. Consequently, the Zhou Dynasty (c. 11th century-256 BC) was born. So goes the origin myth of the milu, or Pere David's deer－a species whose actual recovery story is truly legendary. The global population once barely exceeded a dozen. But its wild herds number around 1,500 today, and over 5,000 live in captivity. This Chinese species' survival and revival is largely due to the actions of a French missionary, a British duke, an American zoologist and the Chinese government's conservation. But China hosts many rare animals that, while they don't have the prestige of the giant panda－wildlife protection's global megastar－still stand out as iconic fauna. China Daily explores some of the places where travelers can encounter these special species, brought back from the brink of extinction. The history of the milu, or Pere David's deer, is one of the world's most dramatic species-survival stories. Habitat destruction decimated the wild population in China. Some believed eating its meat enhanced longevity or even endowed immortality. The deer lingering in the imperial hunting grounds died out around 1900. But, in 1865, French missionary Pere David brought some to Europe, where they ended up in zoos. The 11th Duke of Bedford later gathered 18 on his estate, establishing the lone remaining herd. There were fears during World War II that a single bomb would take out the whole species. A Slovak-born American zoologist reintroduced about three-dozen of the animals to China in 1985, with the blessing of the duke's successor. 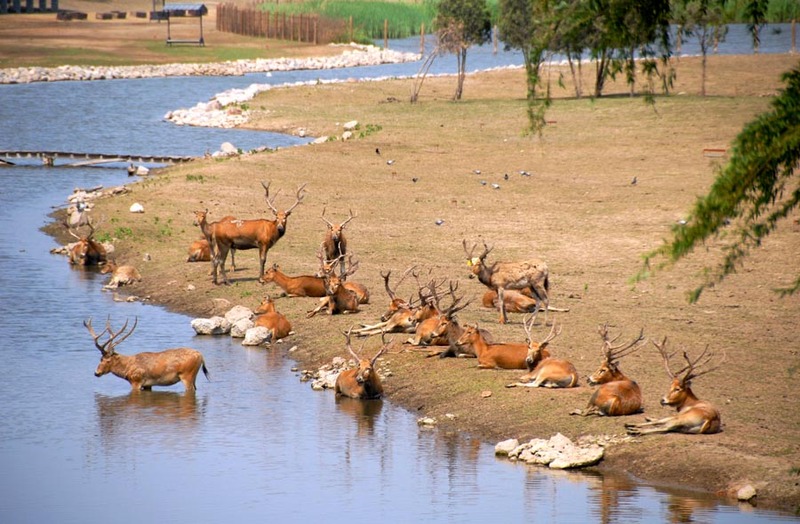 They were taken to the former imperial hunting grounds, which now are the Nanhaizi Milu Park in Beijing's Daxing district, where visitors can encounter the strange and scarce deer. The species' Chinese name, sibuxiang, translates as the "four unalikes". That's because it's said to share physical characteristics of the four animals it mythically contains－the neck of camel or horse, hooves of an ox, tail of a donkey and antlers of a buck. Biologically, Pere David's deer in fact belongs to the moose, muntjac, deer, roe deer and reindeer family of ruminants. So, the ancient Chinese and contemporary international taxonomies agree the animal shares a peculiar mix of features seen in other species. Beijing's Daxing district proposed the milu as the mascot of the 2022 Winter Olympic Games last summer. The results will be announced in the second half of this year. Why did the Tibetan antelope cross the road? To get to the other side, of course! That is, with the help of rangers who act as crossing guards, stopping vehicles along the remote motorways where humans and antelopes intersect in every sense of the word in Qinghai province. Such traffic control is a common site on the remote steppes and alpines of the Hoh Xil region near Yushu prefecture. 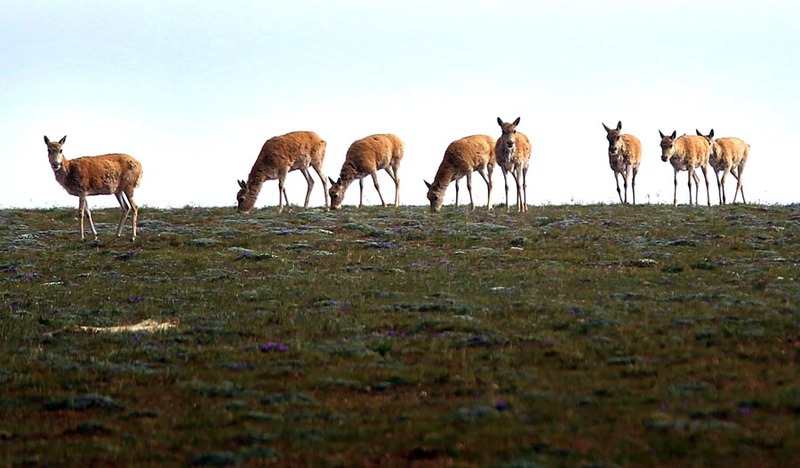 The bovid has become a symbol of wildlife protection on the Qinghai-Tibet Plateau, known as "the roof of the world" and "the planet's third pole" because of its high elevation and low temperatures. The highlands host several rare creatures, including wild yaks, wild donkeys, brown bears and snow leopards. The area is home to around 200 species, about 70 percent in the wild globally. A third of this distinctive ecosystem's fauna are endemic. But its wildlife is struggling as such factors as climate change exacerbate the tundra prairies' desertification. Hoh Xil was named a UNESCO World Heritage Site in 2017 largely because of its biodiversity and the iconic appeal of the Tibetan antelope, which was also a mascot of the 2008 Beijing Olympics. If not caught in a hooves-versus-wheels traffic jam, travelers are likely to still see the antelope cavorting in groups of a couple dozen to hundreds on the grasslands alongside the roads. 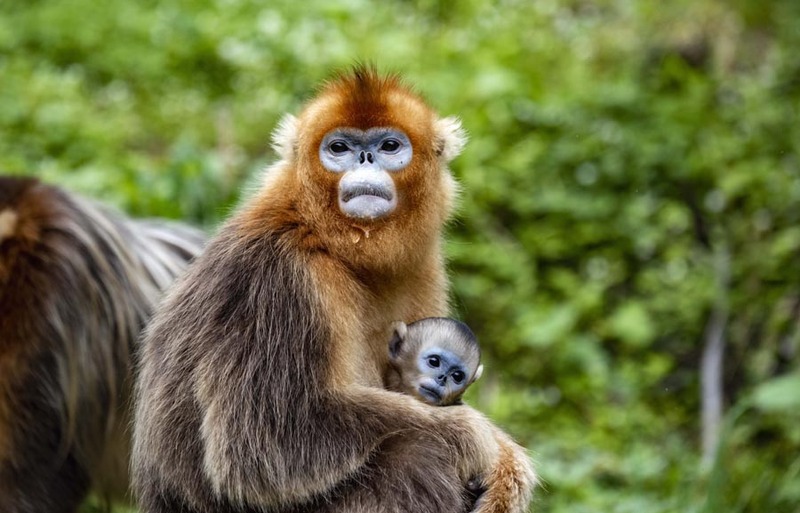 Golden snub-nosed monkeys aren't just rare but also elusive. Residents of Hubei province's Shennongjia Forestry District have a saying about the primates: "You may hear their voices but can't see their shadows." 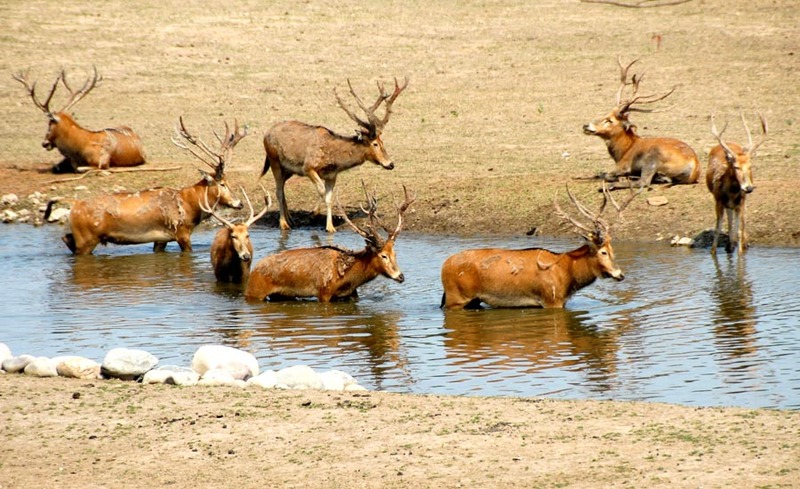 However, visitors to Shennongjia's forested mountains are likely to encounter these wild creatures in a designated viewing area. The monkeys spend around 97 percent of their time in the canopy and are known as particularly social primates. Females even nurse other mothers' babies. Experts believe their communal character may have developed because they live in groups of up to 600, although they may also form factions with as few as 20 members. Some people believe their presence in Shennongjia, which was listed as a UNESCO World Heritage Site in 2016, may explain the local lore of the yeren, which literally translates as "wild man"－aka China's answer to Big Foot. Either way, the monkeys' golden fur and squished visages have made them the face of local ecological preservation. Many people outside of China don't know the country still hosts wild elephants. But locals in Yunnan province's Xishuangbanna are all too aware of the creatures' presence. They often destroy crops, and have killed dozens of people and injured hundreds more in recent decades. So, the local government has devised a system to warn residents of the animals' whereabouts via text message. 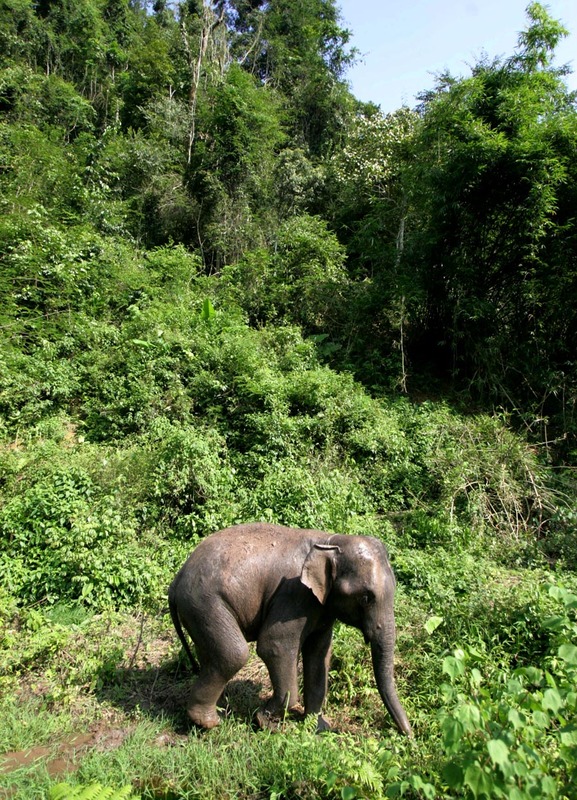 Xishuangbanna's tropical rainforest hosts about 300 of the pachyderms, compared with around 170 in the 1970s. A 2-kilometer-long cable car and an elevated walkway enable Wild Elephant Valley's visitors to safely view the animals. The creatures often drink, bathe, play and nibble silt from which they extract minerals in a gurgling river below the main viewing area. The region hosts much of the biodiversity of one of China's most species-diverse provinces. But the elephants are Xishuangbanna's big attraction, in every sense. SUVs rumble. Tigers roar. And people scream. It's feeding time at the world's largest breeding base for one of the world's most endangered predators. SUVs clad in caging veer through a sea of stripes at the Siberian Tiger Park in Heilongjiang's capital, Harbin. The cats recognize that these are their food wagons and give chase. A vehicle's door bursts open. A chicken is whipped into the air. And the tigers pounce, detonating flashes of feathers and fur. The big cats chow down, sometimes while perched atop the SUVs. 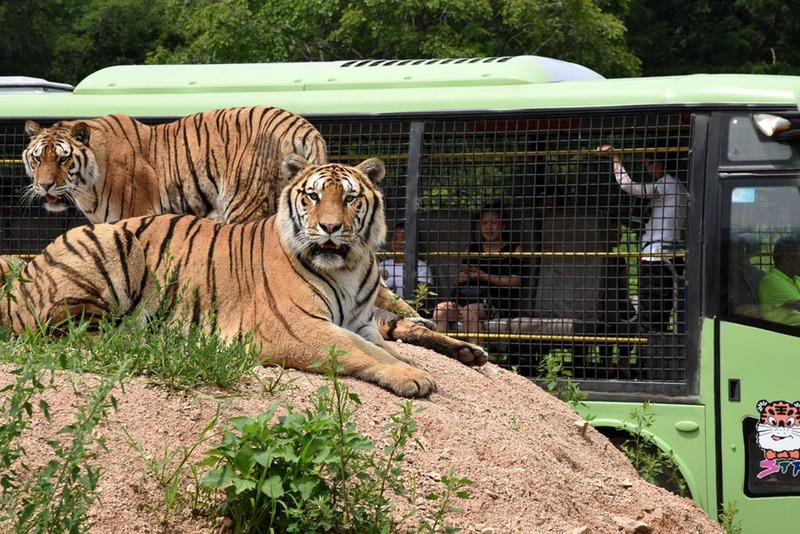 Visitors watch aboard buses that steer through the fenced-in fields the tigers call home. The park hosts about 600 tigers belonging to various subspecies, but the Siberian variety is certainly the most iconic. The fierce felids live in captivity. But visitors will discover exploring the park is a wild experience, nonetheless. The giant panda's "baby brother" certainly plays second fiddle to wildlife conservation's most idolized entity. Even the red panda's other English name, the lesser panda, connotes their sidekick role. Size-wise, the "red bear-cat", as the creature is called in Chinese, is about as big as a household feline. But the cuddly critters are indeed worthy of massive adoration on their own merits. The tree-dwelling, nocturnal animal－the only surviving species of the genus Ailurus and the family Ailuridae－mostly munches bamboo but also enjoys the occasional egg, bird or bug. They can be found at any of the panda-breeding bases in Sichuan's provincial capital, Chengdu. 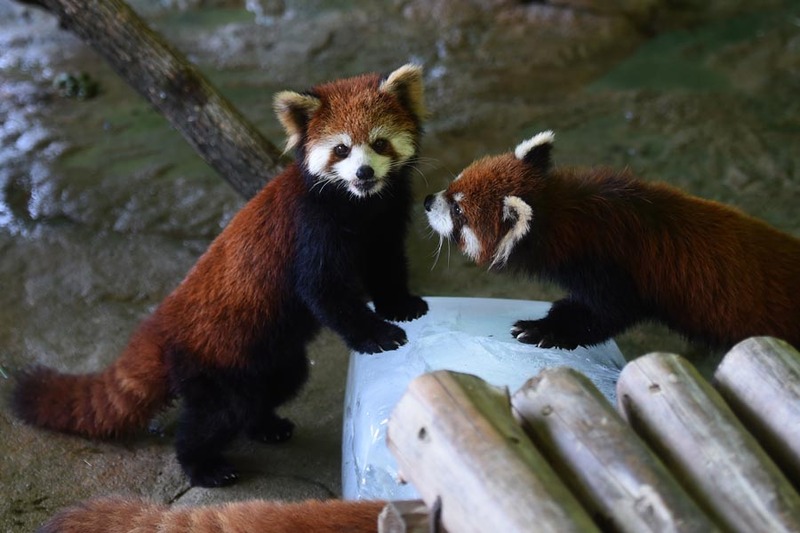 Those who visit will discover the lesser panda is one of the greater icons of China's wildlife conservation, even if the reddish animals live in the black-and-white shadow of their super-celeb siblings. They're a reminder that the country hosts a captivating casting call of rare species that really are the stuff of legends.